Congrats!! Love that IWC used a new movement with this design. you bet she's timeless . congratulations. gorgeous watch. looks great on your wrist. 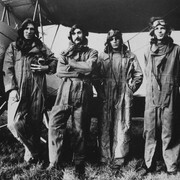 Pink Floyd in Pilot Suits... oh, LOVE The Band. Finally joined the Froggie club. Woohoo I've finally joined the Steelfish club!